Before claiming any gyms for their team, Pokemon Go players must master the art of the battle, and that requires having a varied Pokedex and knowing which type Pokemon are effective against others. Gamers can choose exactly six Pokemon to take with them into battle. In combat, all you have to do is tap the phone to unleash a normal attack and hold down to deliver a special one once it’s ready. But before the battle even starts, you can see exactly what Pokemon you’ll be going up against by selecting the gym and swiping left, getting a sense of what lies ahead. This is quite valuable information, as you can then select your six Pokemon based on what is effective against whatever is stationed at this enemy gym. A lot of this information is simply logical, such as the fact that fire beats ice but is vulnerable to water. Other aspects of it are a bit more random and less easy to figure out without some sort of guide. Luckily, observant players have put together exactly that guide so that you can go into battle prepared. 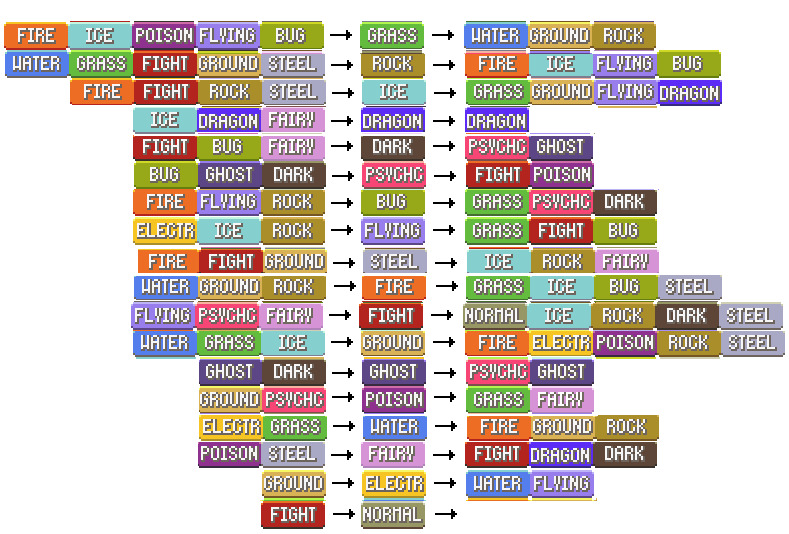 Here are what types every Pokemon is strong against and vulnerable to, based on information from this Reddit chart. Another helpful guide you may want to make use of is a website called Win the Gym. Simply select the exact Pokemon you want to defeat at a gym, and it will give you a list of Pokemon that are effective against it. Heading into a gym battle in Pokemon Go? Use this chart to see exactly what each species is effective against and resistant to.